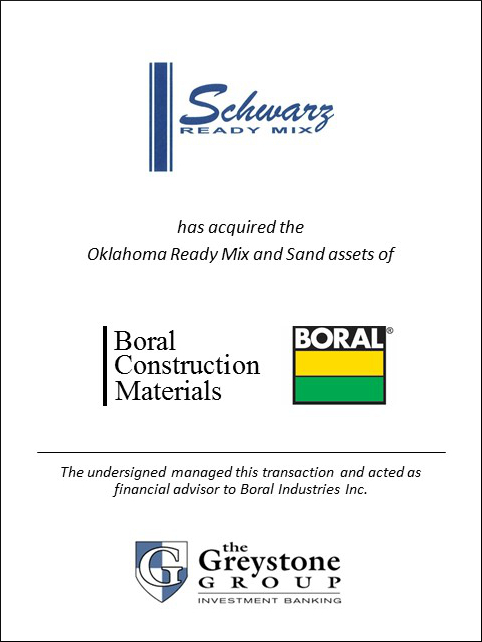 SAN DIEGO (June 27, 2013) – The Greystone Group announced today that it served as exclusive financial advisor to Boral Industries Inc. in the sale of its Oklahoma Ready Mix Division to Schwarz Ready Mix. The Oklahoma City Ready Mix divestiture is the 2nd transaction managed by Greystone for Boral in the past 2 years. “Boral has been a great client for Greystone over the past 15 years. We have provided both buy-side and sell-side advisory services for Boral over the years” said Tim Oitzman, president of Greystone.